For some, the idea of getting paid to coordinate weddings may seem like a dream job. But what are the duties of a wedding planner or coordinator? Wedding planners help build the wedding agenda, including the ceremony, décor, reception, entertainment and more to create a unique experience. But behind the creativity and fun lies a mountain of paperwork, phone calls, and logistics. Wedding coordinators respond to many emails and phone calls from potential brides, current brides and manage a significant volume of files. In fact, the average wedding coordinator at the wedding chapel at Mandalay Bay may coordinate up to 200 weddings each year. Wedding coordinators are expected to maintain files on each individual wedding, including all relevant logistics to a particular ceremony. He or she may serve as a liaison between their client and other hotel/resort resources, such as catering, concierge services, guest room reservations, and other departments. 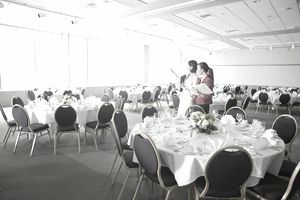 Depending on the volume of events at a hotel or resort, wedding planning may be handled by the conference services and catering department or it may be handled by a dedicated wedding coordinator. A successful wedding coordinator must be personable, possess strong follow up skills, and able to multi-task, according to Ada Casanova, former Assistant Manager at the wedding chapel at Mandalay Bay. Multi-tasking skills are critical. “You may be coordinating a ceremony, and then a bride calls you because a boutonniere is missing. You want to make sure that they have had a phenomenal experience because they will share their experience with others,” Casanova explains. For those interested in wedding coordinator jobs, the good news is that the requirements are frequently viewed as one step above entry level, so this profession is within reach for many who wish to pursue it. Previous experience as a concierge or elsewhere in hotel management. Wedding coordinators and wedding managers are expected to convey a positive image, have strong interpersonal skills, and maintain a professional, well-groomed image. Similarly to job requirements for other event planning professionals, wedding coordinators must have excellent interpersonal skills, understand budgets and have a strong knowledge of hospitality. Wedding managers have the added responsibilities of overseeing the wedding coordinators, meeting departmental expectations such as budget and staffing, and ensuring that they effectively represent the hotel/resort. And everyone is expected to respond quickly to clients. “We have a response time of 24 hours for every email. We work on files 30 days prior [to the wedding] to accommodate workload. We will contact the couple, and finalize the contract,” Casanova adds. Wedding planning is a particular niche within the event planning profession. For some, it may be viewed as an entry career path into larger, more complex meetings and events; for others, it may lead to a path that ultimately allows the individual to create his or her own wedding planning business. To be sure, wedding planning jobs exist throughout the U.S. and may go by many different titles, including bridal consultant, wedding consultants or wedding planner. In addition to traditional benefits, salaries for a wedding coordinator typically range from $26,000 through $34,000. And salaries for a wedding manager typically range from $47,000 to $64,000.